It seems to be a case of "damned if you do, damned if you don't" for Western leaders mulling a strike on Syria this week. Only a few months ago, Middle Eastern audiences had been condemning the West's "silence" on foreign intervention in the conflict. Now, there has been a marked shift in the stance of Arab observers in the region, with some referring to foreign intervention in Syria as “yet another colonial attack” and likening the scenario to the war on Iraq in 2003. Emile Hokayam, author of Syria's Uprising and the Fracturing of the Levant, tweeted on Wednesday: "Not surprised to see Arab officials/analysts privately urging strikes on Syria and staying mum or even opposing them in public. Hypocrisy." In the past week, social media masses have swiftly begun to unleash their ire with user generated content poking fun at the big players in the Syrian conflict. Social media users were torn between those who mocked Assad for getting the cold shoulder treatment by Russian’s Putin, whilst others channeled their creativity to portray that Assad is a victim of a global conspiracy. 'There's nothing left for you to bomb': User generated content on Facebook criticizing Obama for his delay on striking Syria. 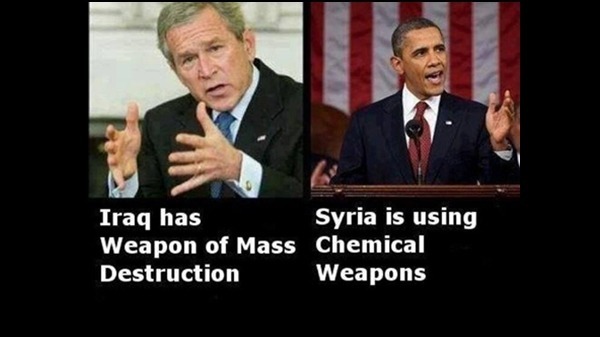 "Obama is Bush. America is America. Down [with] the new U.S. colonialism. No to military intervention in Syria," posted Arab user @MgemyG. Similar posts are flooding the microblogging site since the suspected chemical attack in Syria's Ghouta region last week, which opposition sources say killed at least 1,300 people, sparked the debate over military intervention. Both the opposition and regime have pointed the finger of blame at each other. Analysts say such a shift in public opinion over military intervention boils down to "moral clashes" and "conspiracy theories." "It's a clash between history and morality," Ibrahim Sharqieh, a conflict resolution analyst at the Brookings Doha Center, told Al Arabiya on Wednesday. "There's a deep history of colonialism in this region, and we're still under the impact of the Iraq and Afghanistan invasions, at the same time we have the images of the Ghouta massacre in Damascus. Many are overwhelmed by what they have seen and believe that something should be done." On Facebook, users are posting graphic photos from Iraq's Abu Ghraib prison, where Iraqi prisoners of war were tortured by American forces, with captions suggesting a possible repeat in Syria. Many on social media are also discussing the possibility of a conspiracy, with many asking why foreign military intervention in Syria is only happening now, and not earlier. 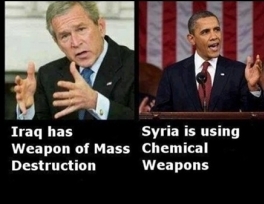 Who really launched the chemical weapons attack? “It doesn’t require much effort to understand that this [the alleged chemical weapons attack] was masterminded and carried out by the Syrian regime,”Ghassan Ibrahim, a member of the Syrian Independent Opposition, told Al Arabiya English. “The attack targeted children, women and the elderly, most, if not all, of whom were civilians,” he added. Ibrahim also attacked those who are criticizing the potential strike on Syria, saying that many of them were at first criticizing the West for not intervening stating conspirastic reasons such as that Syria – unlike Libya – has no oil. For more than a year, Arab leaders have publicly maintained that any international military action there should be sanctioned by the U.N. Security Council, where Russia and China have blocked action. The allies to the Syrian regime, as well as the failures of the Security Council, have been condemned by the Arab public. And as the atrocities committed in Syria mounted, voices pleading for foreign intervention became louder, sharpening up the global debate and prompting Gulf states to provide military and financial assistance to opposition fighters. Sheikh Hamad bin Khalifa al-Thani, the then Emir of Qatar said in January 2012 he favored sending troops "to stop the killing," becoming the first Arab leader to say so publicly. But as the Arab states' warnings against Assad and supporters of the regime fell on deaf ears, the calls for intervention across the Arab world quickened. This week, however, a slight dilpomatic shift in Arab stances has been noticed. Arab League delegates on Tuesday urged the U.N. Security Council, rather than the West, to take "deterrent" action against Syria to prevent a repeat of alleged chemical attacks on Aug. 21 in the suburbs of Damascus. In Cairo on Tuesday, Egypt Foreign Minister Nabil Fahmy appeared to side against intervention, saying: "The solution for Syria must be diplomatic, not militaristic." Syria's neighboring Lebanon and Jordan have also voiced fears of a possible retaliation and a further influx of Syrian refugees in the event of a Syria strike. Lebanese Foreign Minister Adnan Mansour said on Monday that he did not support the idea of strikes on Syria, saying: "I don't think this action would serve peace, stability and security in the region." For regional political reasons, Arab leaders would think twice before publicly saying they back a Western-led attack on an Arab country, said Dubai-based political-science professor AbdulKhaleq Abdullah. Overall in the Arab world, "People would just look the other way, and hopefully it is brief and surgical and doesn't extend too far," Abdullah told the Wall Street Journal this week. "In an atmosphere poisoned by persistent violence in Iraq 10 years after the U.S. invasion there, and by top-level disputes between the U.S. and its Mideast allies over the international response to revolutions in Egypt and elsewhere, the Arab world at large is split over whether the West should intervene," writes Riyadh-based Riyadh-based journalist Ellen Knickmeyer for The Wall Street Journal. The main struggle is over who intervenes in Syria, notes Sharqieh. "There is certainly a moral justification now to take action of some sort. The question is, where should this action come from, which is what many are struggling with in the region." "The only available form of action now is an international coalition, which of course involves the West. Again, the idea of the West is where we remember a clash with history and the concept of colonialism," he adds. Sharqieh believes that now the masses are realizing that there are "no other options" to confronting the violence. "There's an urgent need to stop the chemical weapons use against civilians. Many are not accepting, but accommodating, the idea of foreign intervention in Syria."